Suppose your skating coach told you to try skating with your laces tied, would you do it? You’d know enough not to attempt it. In freshman comp, instructors often set up a situation that quietly sabotages learning the way tied laces would, but the students don’t realize they’re being set up to fail. They attempt to comply with the instructors but their learning goes slowly. Some then blame themselves for being stupid. I’ve described this in many places, but will repeat it with the ice-skating image in mind. Writing is a two-tier, or two-level skill. We all know that, but we don’t apply it when we teach. Writing is NOT one thing, but two things, in a hierarchy. The first skill is sentence construction, that is, the writing down of good and solid sentences. The second skill is the arrangement of those solid sentences into an essay, letter, term-paper or report. Without those solid sentences, no essay or report is possible. The two skills are related, closely related for that matter, but they are not the same. Sentences–they’re one thing. Essays–though they require sentences as building blocks–they are arrangements of sentences. Teachers who ignore the difference, and jump around from one to the other, produce confusion in their students. Since these are two different skills, they should be taught separately. Sentence writing should be taught as its own topic. 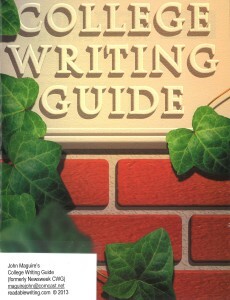 Essay writing (the arrangement of sentences) should be taught as its own topic. It’s obvious which skill comes first. Forty years ago, before open admissions to community colleges, etc, no one showed up in college writing bad sentences, fragments or run-ons. Those students did not need much, if any, sentence instruction. But today students write incompetent sentences and can’t see them nor fix them. Given this fact, sentences must be covered. But don’t stir instruction about sentences into a comp course willy-nilly, whenever you’re inspired. Doing that is confusing, especially to the students who really don’t understand the basics of sentences and have to master them. All the sentence instruction should come first. Whatever you have to say about writing sentences should be taught as its own unit, early in the course. That way the slower students who need the material most have a chance to learn. Jumbling sentence instruction into a course any old way just makes things so much harder. It’s a burden like having your skate laces tied together. Don’t do it.